The Bike Brake LED Light can provide ultra bright light, and the sided 4 LED lights are brake lights, the middle 3 are tail lights with fine workmanship which make your bike highly visible and you can never worry about riding in the dark again with it. Worth your buying! ENSURE SAFETY CYCLING: It can guarantee your cycling safety with durable material and super bright light which make your bike highly visible and you can never worry about riding in the dark again with it. 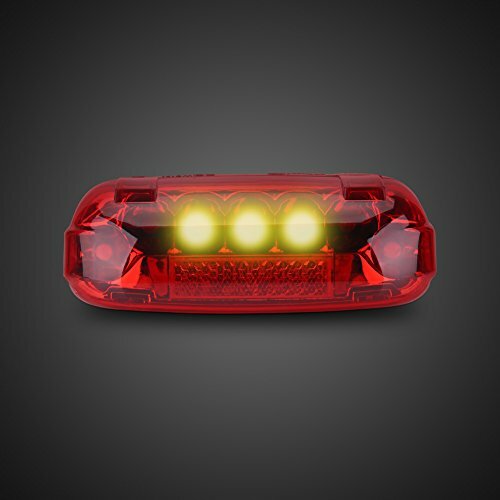 ULTRA BRIGHT: Provided with ultra bright light, and the sided 4 LED lights are brake lights, the middle 3 are tail lights with fine workmanship. EASY TO INSTALL: It is lightweight and easy to use and install with mounting screws, make your riding safe during Night. GREAT ACCESSORY: This product is built for night and outdoors that you can be seen from miles away, suitable for all electric scooters owners and riding lovers.